Chapter 4 described models of the appearance, shape, and atmosphere of the Earth. This chapter is concerned with modeling properties of the spacecraft environment that are relevant to attitude determination and control. Sections 5.1 and 5.2 describe the magnetic and gravitational fields of the Earth, although many of the modeling procedures can be extended to other planets as well. Section 5.3 discusses the interplanetary medium known as the solar wind. The remaining three sections discuss models of the position of various objects needed for attitude determination—the spacecraft itself, the Sun, the Moon, the planets, and the stars. Although the general characteristics of the Earth's magnetic field have been known for centuries, the first systematic study of the field was initiated by the German mathematician and physicist Karl Gauss* in the early part of the nineteenth century. Since that time, a great deal of data has been accumulated, much of it as a result of spacecraft measurements during the 1960s. Although this body of data has served to increase our ability to accurately describe the field, it has not yet provided the key to the physical processes which produce it or perturb it. Thus, in this section we will describe the observed phenomena and, wherever possible, provide plausible arguments for their existence.
' Among his many contributions, Gauss was also the first to apply least-squares analysis to the problem of orbit determination. in the past with time scales of 70,000 to 100,000 years between reversals [Haymes, 1971]. The plane perpendicular to the Earth-centered dipole is called the magnetic equator. The field is weakest there, being about 3 x 104 nT at the surface of the Earth. 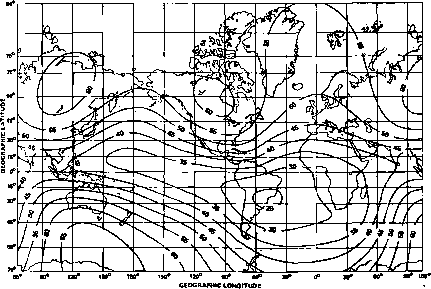 Figure 5-1 shows the variation in the dipole field strength as a function of altitude at the magnetic equator. 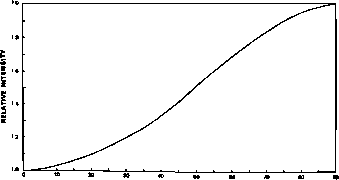 The field strength increases by a factor of two as the magnetic latitude increases from 0 deg to 90 deg, as shown in Fig. 5-2. At the geomagnetic equator, the field is horizontal relative to the Earth's surface. At a geomagnetic latitude of about 27 deg, the field is 45 deg down from horizontal. plots of the field strength for various altitudes are given in Figs. 5-3 and 5-4. Note that as the altitude increases, the contours become more regular and begin to resemble a dipole field more closely. The low in magnetic intensity at about 25°S, 45°W (called the Brazilian Anomaly) together with the high at about 10°N, I00°E implies that the center of the magnetic dipole is offset from the Earth's center. In 1975, the eccentric dipole was offset 474.2 km in the direction of 19.5°N, 146.9°E [J. Bartels, 1936], The eccentric dipole is moving outward at 2.4 km/year, westward at 0.19 deg/year and northward at 0.23 deg/year. The eccentric nature of the dipole can be described mathematically as a quadrupole distribution of magnetization. 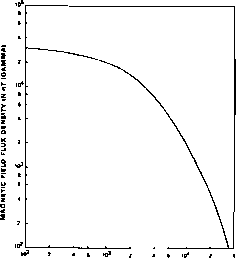 The maximum deviations of the centered dipole model and the quadrupole model from the actual field of the Earth are shown in Fig. 5-5.